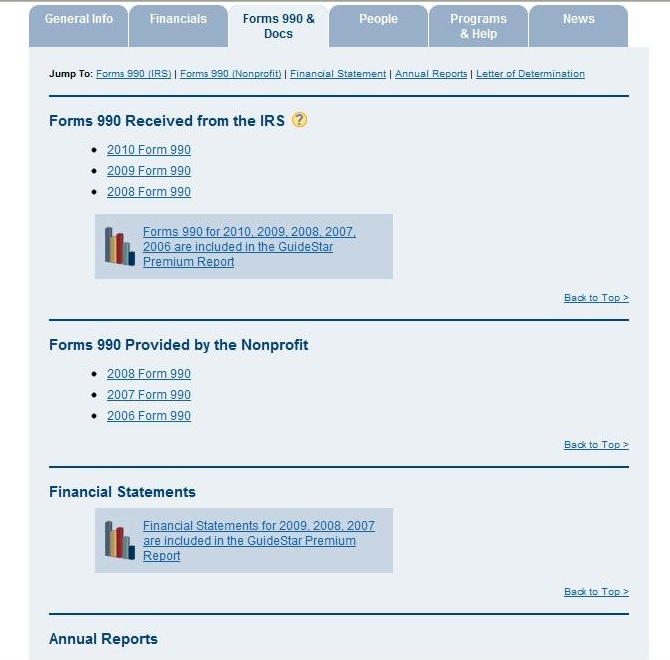 Thousands of Nonprofits, known to the government as 501c3 organizations, exist in the United States. A nonprofit exists for nearly every social issue we could imagine, plus 10,000 more. How then, can you know which organizations are legitimate, honorable, and worthy of your time and money? This is the organization of organizations. Guidestar compiles information about the gazillion nonprofits, and displays that information for all to see. Here’s what you’ll see on the Nonprofit’s “home” page within Guidestar. We have their contact information, mission statement, and background in one site. You can spread the word through the main social media outlets, or make a donation. To go a little deeper, you’ll have to register with the site. This is free, and opens a portal of nonprofit information. Notice that you do not have to be a member of a Nonprofit to register. Once you register and confirm via email, you have access to resources such as: Organization financials, statistics, board members, volunteers, etc. The law requires Nonprofits to report their financial information in detail, so don’t feel bad about snooping. Again, this is free, public, information. This is a great way to be responsible with whom you choose to give your money to. You can see what that organization does with your money, determine if they are spending it well, and if they are actually accomplishing what they say they are working towards. YOU get to decide if the organization operates efficiently enough to deserve your hard-earned cash. One Nonprofit may meet my standards of excellence, but my standards aren’t yours. If you’ve been on the website of a large nonprofit, you may have seen a logo that says “Charity Navigator, 4 star charity”. Charity Navigator personally evaluates over 5,500 of the largest nonprofits in the country, rating their financial health based on organizational efficiency and capacity. The rating includes keeping administrative and fundraising costs within reason, focusing the majority of funds towards their programs and services. Here’s a glance at the “home page” for Mercy Ministries, a 4-star organization I support. On the left, you see contact information, including the name of the chairman of the board. There’s a donation option, and sharing information so you can help spread the word. 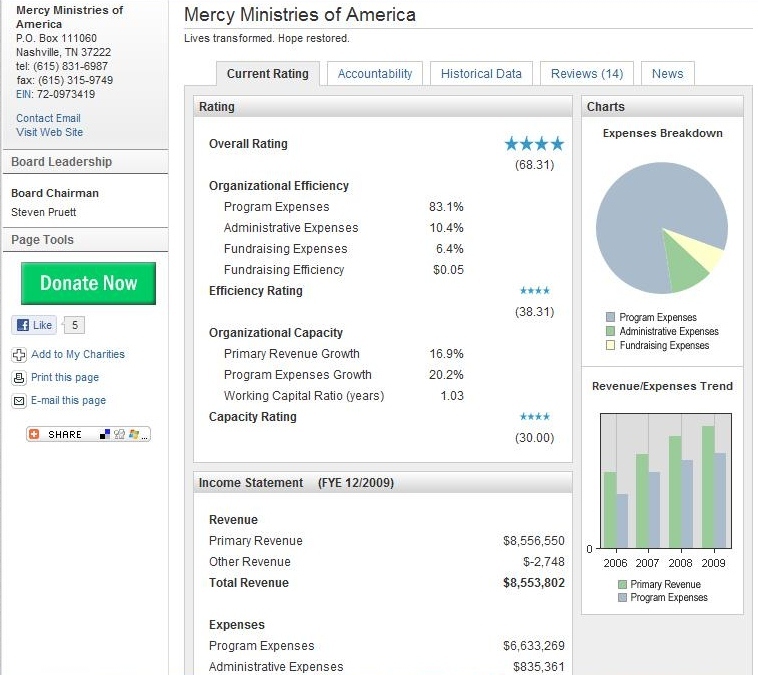 In the center, you can see an overview of Charity Navigator’s organization evaluation. The stars are visible for each main category rating, the income and financial information displays right off the bat. The pie chart on the right offers a quick glance to see how this organization funnels their donations. You can see several other tabs, as well. 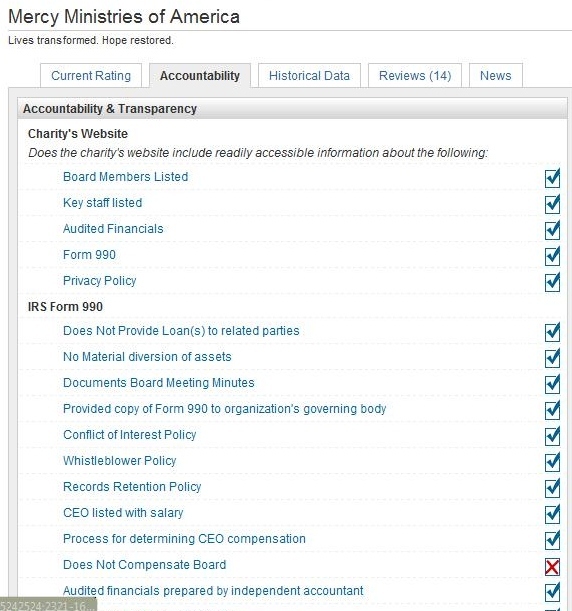 Here’s a glance at the Accountability tab. You’ll see it includes a checklist so you can see specific details and how they measure up. Good job, Mercy Ministries! All of this information is free and public, no registration required. Some details, such as the Historical Data tab, do require registration. With registration (free), you have access to bonuses such as comparing different organizations side-by-side, or writing reviews. Both of these sites also offer great tips and resources for donors. KEY: The main difference between Guidestar and Charity Navigator? 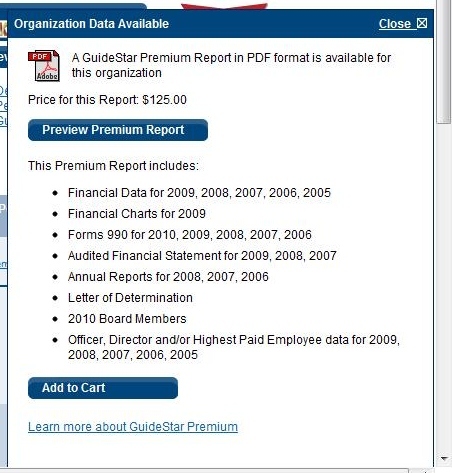 Guidestar contains a comprehensive database of all the nonprofits in the United States, reporting data and records, while Charity Navigator is more selective but they personally check and rate each organization. The above are two terrific resources for you to begin investigating charities and their financial integrity. I highly recommend that you use them both when considering donating either your time or money. However, like anything else in life, nothing beats a personal connection. Granted, occasions come up when a personal connection turned out to be not unreliable, but we learn from those and move on. Trust your instincts; you’ll know when something smells fishy. In a previous post, I recommended going local with your time and money. I think this theory can transfer to other circumstances. For example, the Haiti earthquake last year generated millions of dollars for disaster relief for major nonprofits. However, it was the smaller, lesser-known organizations that were making a big impact on the ground. People who already lived in Haiti, who knew the country and its citizens, who knew about existing resources and could determine precise needs. Experience triumphs media attention, every time in my book. It didn’t take much searching to find several small groups in Haiti that really needed funds, and that were using those funds – with integrity – to immediately provide relief to such an enormous disaster. Practice now! Take 5 minutes, and go to both Guidestar and Charity Navigator websites. Think of an organization in your area, or one that you have given money to in the past. You can search immediately on the front page, so type in the name and see what you find out! Post in the comments the name of the organization you support and let us know what you found. That’s a lot of information for one blog post, but I hope you find it helpful. Don’t give your money to everyone that asks, and allow yourself to do some spy work. With only a small effort, you can confidently give your time and money to organizations that are truly doing what they can to change the world. 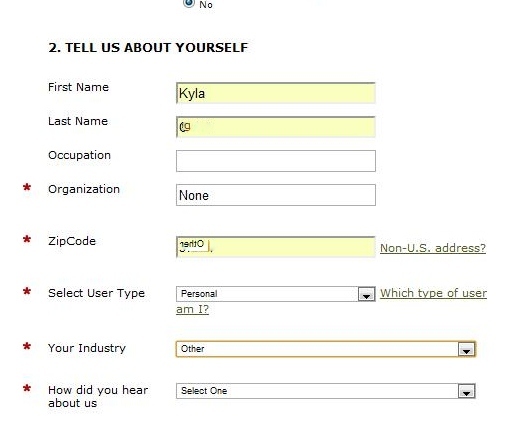 This is great advice, Kyla! When I worked at a non-profit, we always paid special attention to the information we had listed on Guidestar and Charity Navigator. 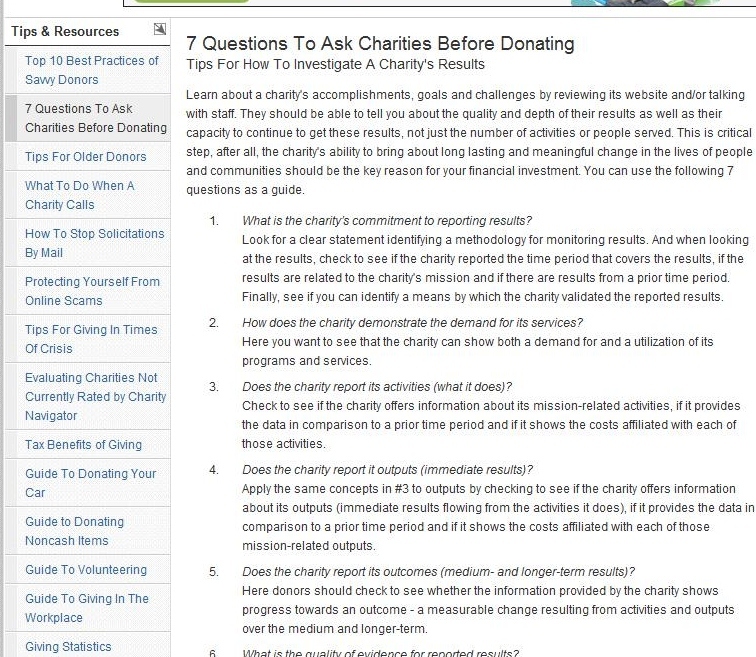 Good charities will really take the time to provide both websites with a wealth of information. I think both sites are a great place to start because it provides a thoughful, unbiased analysis of a charity. But as you mentioned, there's nothing like a personal recommendation. Research coupled with endorsement from a friend will ensure your money goes to the right place. Great post! And, I'm so proud of you for launching the new site – it looks great!!!! CONGRATS! Thanks, Laura. You make a great point: Nonprofits need to make an effort to provide information. Doing so gives the public more confidence in supporting the mission of the organization. Thank you so much for this advice! What should people do when they find a fake non-profit? Can we report it somewhere? That's a great question, Casey. I don't know the answer. If you've done the research and are pretty sure the organization is sketchy (do people still use that word? 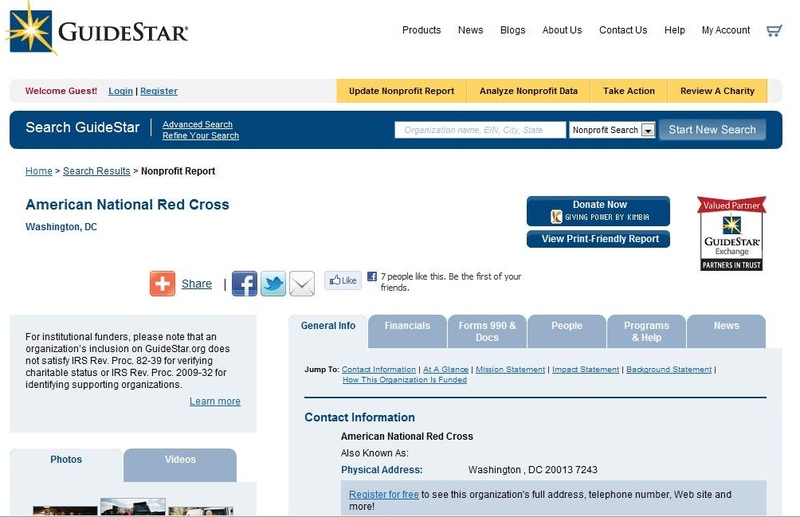 ), you might give Guidestar or Charity Navigator a call and ask what they recommend. Maybe they've already heard something. Word of mouth has been known to work, as well! Thanks for reading, glad the information was helpful.